SUP School – Beginners – Safety, Posture and basic Technique. SUP Training – Practice specific techniques in order to maximize your enjoyment of SUP board activity. 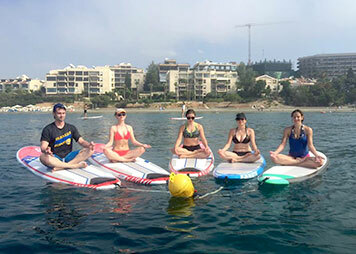 SUP Pilates & SUP Yoga – The perfect combination of SUP with Pilates exercises and Yoga. 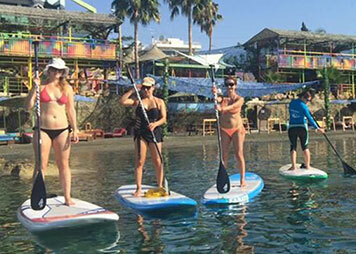 SUP Fitness – A unique lesson for fitness improvement, including paddling and fitness exercises on the board, while floating on the water. Group Paddling – Flat water cruising and the practice of different techniques. Paddling Groups lessons will be subject to weather conditions. The lessons schedule will be published on our Facebook Page. 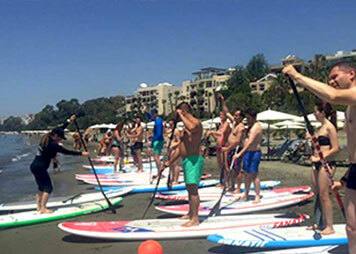 * Each lesson includes land based workouts (warm up), paddling technique and water workouts. * Private and Couples lessons are available upon request. * All participants are expected to be confident swimmers. * Paddling Classes are subject to weather conditions. Yoga and Pilates classes will be held on the beach in case of strong winds. Each lesson duration is 1 hour. Participants are advised to arrive 10 minutes early in-order to get dressed and organize their SUP board. You will be supplied with a SUP board, paddle and leash for the lesson time. All you need to bring is your own clothes and towel. A hat, sunglasses and sun screen are recommended. At this stage we can only accept cash only. Want to join a lesson? Call us: +357-97-796746 / +357-95-582100. You can also send us a message using the contact form, HERE. SUP beginners – Introductory to SUP lessons, SUP equipment, SUP safety, posture and position, paddling techniques, balance and practice. SUP Pilates: 15 minutes paddling session and 45 minutes of pilates exercises on the board. SUP Yoga: 15 minutes yoga session on the beach and 45 minutes of yoga in the water, on the board. Have your own SUP board? Cool! – Contact us for rates. Kapriza - Cyprus Tours, Team Building and Corporate Events.